It seemed pretty rich for Wildrose Party Leader Brian Jean to announce he was shocked -- just shocked! -- at the threatening and misogynistic tone of the unending stream of hate-filled social media posts that has lately been directed at Alberta Premier Rachel Notley, including many comments threatening her life. 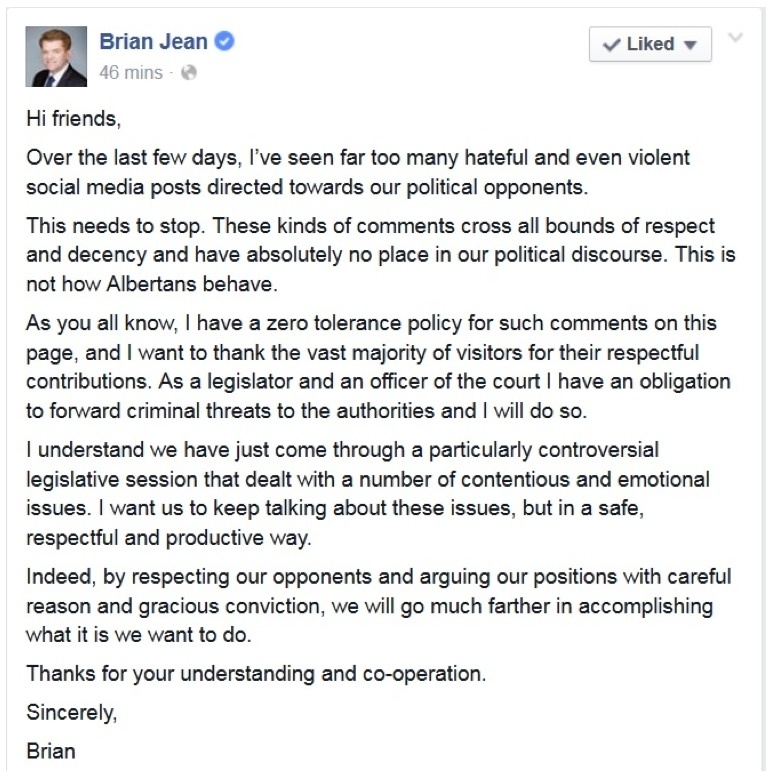 Henceforth and forever more, Jean vowed in a social media post of his own late last week as the threats against Notley continued to pile up on pro-Wildrose social media pages, he would "have a zero tolerance policy for such comments" on his own Facebook page, rather than leaving them up for long periods of time, as had sometimes happened in the past. There was no acknowledgement of whom has been receiving the threats in Jean's short statement, nor any suggestion he would ask his own MLAs to stop fanning the flames with absurd claims about Bill 6, the NDP's now-passed Enhanced Protection for Farm and Ranch Workers Act, which requires agricultural employers to enforce occupational health and safety standards and provide Workers Compensation coverage for their employees as in all other Canadian provinces. There was no public complaint from the Opposition leader, for example, about Lacombe-Ponoka Wildrose MLA Ron Orr's Tweet last Friday, since deleted, that wildly suggested the NDP intends to "kill farmers." "Sorry folks," Orr later apologized rather unapologetically. "Last week I sent a tweet with too strong of a word." Nor did Jean promise to stop his party from calling the NDP "communists," as it did in materials distributed in a recent Calgary byelection, and as its supporters regularly continue to do on social media. Well, better late than never for Jean to tell his seething Wildrose supporters, who without a doubt feel that they was robbed in the May 5 provincial election that brought Notley's NDP to power, that "this needs to stop." The Wildrose may very well now want to move on from the issue of actual death threats made by its supporters, which have the potential to damage the party's electoral chances and derail its efforts to absorb the Progressive Conservatives before they figure out they’re better off rebuilding their own big-tent, small-c party. But it's hard to imagine the instinct for hyperbole bordering on hysteria characteristic of Alberta's far right, which constitutes the core of Wildrose support, changing any time soon. For its part, mainstream media tried to suggest, preposterously and disgracefully, that there is a rough equivalence between the obscene, violent, threatening and sexually charged rhetoric emanating from conservative extremists and the exasperated and offended responses by progressives. Many commentators on the right have also worked hard to create the impression it's always been like this in politics, and that all politicians regardless of their gender receive a certain number of violent threats. This claim is just true enough that it's dangerous. Certainly people connected with the governments of Ralph Klein, Ed Stelmach and Alison Redford all tell stories of having to deal regularly with threats and very ugly commentary. Wildrose insiders say former leader Danielle Smith was also subjected to some of the same abuse. Still, the lurid and sexually violent language we are hearing now seems to have been getting worse since Redford was premier and it's certainly not getting any better now that another woman is in the province's top political job. Anecdotally, this problem seems to be worse in Alberta than in other provinces, too. Surely this bullying behaviour is designed and intended to intimidate and discourage female politicians, especially on the progressive left, and perhaps in some cases to encourage real violence. "I really want to push back against the idea that what we’re seeing with Notley is part and parcel of what others in politics experience," University of Calgary Political Science Professor Melanee Thomas observed yesterday. "That argument suggests that, because other politicians get nasty communications, too, what we're seeing with Notley is not different, and cannot be about ideology or gender as a result," said Dr. Thomas, whose comments in a CBC article on this topic caused a stir earlier this week. "I certainly know that all politicians get really horrible communications from constituents," she told me in an email. "But, there's a language used to describe women in English that doesn't exist for men. To me, that suggests it's qualitatively different when a woman in politics gets called the c-word (as is often the case now) … vs. when men in politics get called stupid (as was often the case with Stelmach)." "I hypothesize that part of the reason why Notley is getting this as badly as she is has to do with the fact that her government is new and New Democrat," Thomas explained. "And, sadly, it seems as though the Official Opposition has been willing to let moderation of their online spaces slide." "Unpleasant, mean comments are one thing," Thomas concluded. "Death threats and sexualized, derogatory language? That’s something else." Of course, back when Klein was premier, anti-social media wasn't the factor it is today. Facebook wasn't launched until the final year and a half of Klein’s premiership. Twitter only went live eight months after his successor, Stelmach, became premier. In those quaint times, threats to Klein mostly arrived by email and were handled quietly by police without any public knowledge. Nowadays, the whole ugly business is played out where everyone can see it. This is unpleasant, but it has some positive benefits: We can see very clearly where this poison is coming from, and often exactly from whom. Moreover, there's pressure on the police to actually do something about the death threats and other criminal behaviour. And a politically engaged citizenry is disinclined to allow politicians whose supporters act like this to sweep the problem under the carpet, or pass it off as the proverbial few bad apples.